Peryite, also known by the title of the Taskmaster, is one of the Seventeen Daedric Princes that dwell within the realm of Oblivion. Although he is typically depicted as a green four-legged dragon (and often takes on the form of one), Peryite is considered one of the weakest of the Princes. His sphere of influence includes tasks, natural order (to not be confused with the perfect order of Jyggalag), and pestilence. Some unfortunate Dremora Churls and Caitiffs find themselves in the employ of the Taskmaster. Peryite's summoning day is the Ninth of Rain's Hand, but an incense can be created from vampire dust, one silver ingot, a deathbell flower, and a flawless ruby that will allow one to communicate with the Prince. He "blesses" his worshippers in the form of diseases, and is considered one of the more malevolent and destructive Princes. His enemies are the deities Ebonarm, Vaermina, and Mephala. Peryite has been known to appear as ghostly apparitions of vermin, such as skeevers, and according to Kyne's Challenge the goddess gives him the spirits of skeevers when they die. The Song of Despair, a poem about the Daedric Princes, states his breath pollutes "both cloud and pool". According to the demiprince Fa-Nuit-Hen's tutor, Riparius, Peryite is in charge of keeping daedrons - chaotic creatia made sentient from the exertion of Daedric or mortal will - from causing damage in Oblivion, mainly through events known as 'realm-rips'. When asked, Riparius says that "trying to keep ahead of it all keeps Peryite mighty busy, but nobody really feels sorry for him - after all, he earned it." It is also theorized that Peryite may have been involved in the creation of the Thrassian Plague developed by the Sload. 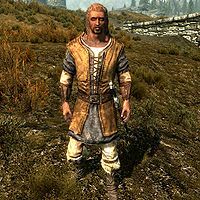 Peryite's worshippers are not well known or documented, but a particular group known as the Afflicted were Bretons located within the Reach of Skyrim during 4E 201. Peryite's "blessing" for them was infection with a plague, although they were also granted some amount of resistance to its deadly effects. They had unusually bright red skin and the ability to spit poisonous vomit at their enemies, but were eventually killed by Peryite's champion in his quest to kill their overseer, the Wood Elf known as Orchendor. 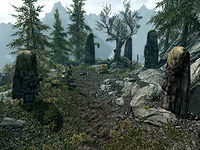 Originally from the town of Cul Aloue in High Rock, they were 'shepherded' to the Dwemer ruin of Bthardamz. According to Kesh, Orchendor and the Afflicted were "meant to stand ready, awaiting Peryite's command to cover the world with his Blessing." The Afflicted also used the titles of 'monk' and 'apostle', as well as strange draconic totems and brews in their worship of Peryite. The 1st Edition of the Pocket Guide to the Empire states that Peryite's "Foundation is Falling Rock". 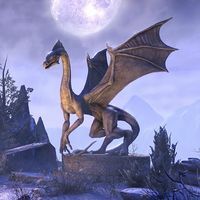 There is apparently an ancient shrine to Peryite located on the Summerset Isles that depicts Altmer fighting "slug-like creatures" according to the section on the Isles in Kyne's Challenge. In cut dialogue/text in Daggerfall, Peryite is described as the "most affable of the Daedra Princes with the worst reputation." This page was last modified on 24 February 2019, at 08:13.